On March 7 at 8:30 pm EST (5:30 pm PST/ 6:30 pm MST/ 7:30 pm CST), AASLH will hold a #AASLHchat on Twitter. The topic will be “Museum Advocacy" and is a continuation of our Everyday Museum Advocacy webinar happening the day before (Monday). 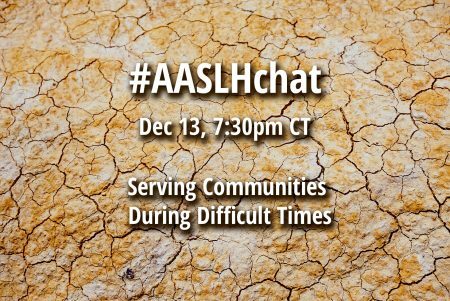 On December 13, AASLH held our third #AASLHchat on Twitter. These monthly discussions are shaping up to be a great way for AASLH'ers to crowdsource new ideas and fresh solutions to challenges facing history organizations. In September, in the midst of Pokémon Go and Hamilton buzz, we held our first chat on "Incorporating Pop Culture Phenomena into Tours & Programming." After our Annual Meeting, the second #AASLHchat explored "Issues Facing Emerging History Professionals." Our latest social media meetup tackled the tough subject of how history organizations should be "Serving Communities During Difficult Times." You can see the Storify of the chat here. Make sure to follow AASLH on Twitter so you don't miss our next #AASLHchat, which will take place in January (date and subject have not been set yet). On November 1 at 7:30pm cdt/ 8:30 est, AASLH will hold a #AASLHchat on Twitter. This chat will be guest-hosted by the Emerging History Professionals Affinity Community, and the topic will be “Issues Facing Emerging Professionals." To participate in the open chat, just watch the AASLH Twitter account (@AASLH) and/or the hashtag #AASLHchat at the chat time. Specific prompts will be given at that time. Anyone is welcome to participate in the conversation.